Have you checked in your backyard garden lately? You might be surprised to see some new birds there. Spring migration is at its prime right now and it sure is very exciting! Just in the last few days here in Northern Kentucky, we have had a Ruby-throated Hummingbird, a Rose-breasted Grosbeak, a Green Heron, a Yellow Warbler, and two Baltimore Orioles at our feeders. 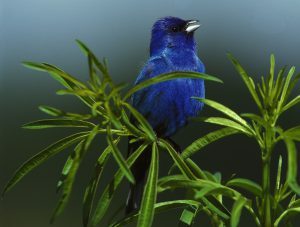 There was also an Indigo Bunting in our River Birch tree. The Baltimore Orioles are a first for us in our backyard. We have seen them in our neighbor’s yard across the way who has a number of fruit trees (they like these) but never in our own yard. So the fact that we finally attracted them in is pretty awesome. How does that saying go? If you feed them they will come. 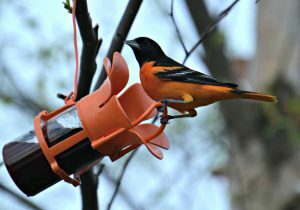 Well we were definitely ready for the Orioles this spring with our jelly feeder and oranges in the trees. 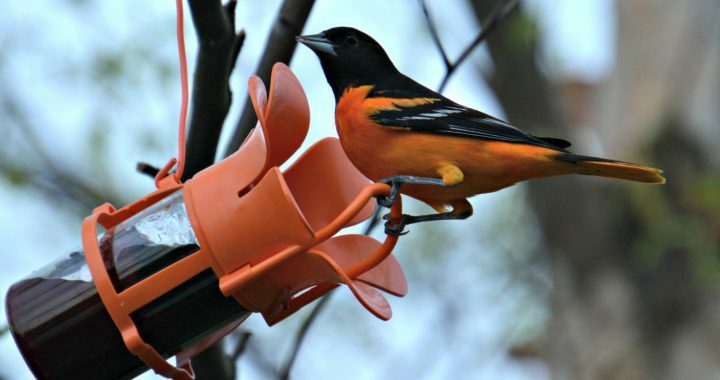 You see you have to put your Oriole feeders out early enough (at least a week or two prior to their arrival) because if you don’t they may not stick around. Of course if your backyard habitat has fruit bearing trees like the cherry, serviceberry, blackberry, blueberry, and chokecherry which they prefer, you probably get them without even trying. We only have two fruit trees in our yard as we do not have the room for any more. So it is more of a challenge getting them and keeping them around. Keep in mind that Orioles also eat insects such as caterpillars, beetles, grasshoppers, wasps, snails, and spiders too and that is not a problem. That is just the highlight of what is yet to come. Still migrating through are the Scarlet Tanager (photo above), Summer Tanager, Orchard Oriole, and loads of Warblers (that’s another post) just to name a few species. There are plenty more. Many people do not even realize that there are so many other beautiful songbirds other than the more common ones that they see throughout the year. I’m talking about the Northern Cardinal (some people know them as red birds), Blue jay, American Robin, Carolina Chickadee, Tufted Titmouse, White-breasted Nuthatch, and Carolina Wren. This is mostly because the migratory birds may just be passing through and never get noticed. That is the beauty of migration, you get to see a lot of different birds coming through your yard for a quick moment, an hour, or possibly a day or two or more if you are lucky. You just never know. AND…boy are they pretty! That is because they are in their summer plumage, bright colors and all. These brighter colors are for attracting a mate during nesting season. You don’t get to see this during fall migration because they have a much duller plumage. Why do some birds just pass through? The reason is because they are heading further north where their breeding grounds are. Your backyard could be a stopover point for these birds. When birds are migrating they need to stop and rest and replenish before moving on. They have traveled a long way and need to refuel. So it is good to have your feeders full, have your birdbaths filled with fresh water, and also provide shelter (i.e. shrubs, trees, nesting boxes) to protect these birds from predators and bad weather. They may also use them for roosting too. Some of these bird species do stay throughout the summer months and some keep moving northward. For example, the Ruby-throated Hummingbird is found mostly on the eastern half of the United States. Some of them will live in the more southern states while others continue up as far north as Canada. Many hummingbirds return to the place where they were hatched so it all depends. Another example is the Baltimore Oriole. There will be some orioles that stay for the summer here in Northern Kentucky while others will keep migrating up towards Michigan. 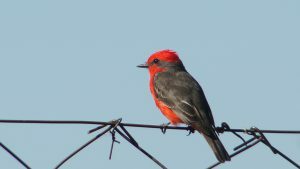 Spring is a great time to observe bird migration in your backyard so take notice. May is best for us here in Kentucky but you might find based on your specific location that yours is either earlier than this or later. There are migration maps that you can check that provide the time frame for where you live for different species of birds. Once you have this information you can get ready for them as we do by making sure your feeders are full, having water in your birdbaths, and by providing shelter from predators and the elements. This will help the birds refuel as they continue their journey northward. Or depending on the species, they may stick around for the summer for your enjoyment. The trick is to accommodate them continuously by feeding them and providing a water source to ensure that they stay. The Orioles that I mentioned earlier in our backyard are still here. This is day 3. My husband and I are hoping that they decide to nest here. If that is the case we will be investing in a lot of jelly and oranges to make them happy. Or should I say make me happy :-). How about you? Have you experienced the spring migration yet? 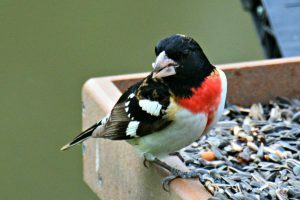 I would love to hear about your backyard birds. Please feel free to make your comments below. Posted in Backyard Birds, Songbirds and tagged backyard birds, orioles.